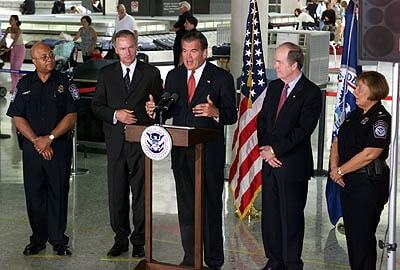 Customs-Trade Partnership Against Terrorism (C-TPAT) is a joint initiative between U.S. Customs and business. Apparel Search Logistics offers consulting services to help clients revamp their cargo security procedures for their personnel, facilities and supply chain partners in order to become certified. As a result of September 11th, more and more companies are making cargo security their top priority by applying for C-TPAT certification, but they need significant help! Faster customs processing of your cargo at the border. A more secure supply chain and a safer work environment. Potential admission to other valuable U.S. Customs programs. Access to the U.S. Customs database of approved C-TPAT vendors and partners. A designated U.S. Customs account manager. Dedicated commercial lanes where infrastructure permits. The C-TPAT program addresses requirements and recommendations for Importers, Brokers, Manufacturers, Warehouse Operators, Air Carriers, Sea Carriers and Land Carriers. The program requires a comprehensive third-party assessment or validated self-assessment of the entire supply chain. It also requires that all service providers and vendors within your supply chain(s) begin working to build these guidelines into the operations that impact the movement of your goods, globally. Finally, you must provide written documentation demonstrating the guidelines have been implemented and can be verified within your facilities, and further that you are encouraging your partners to comply. Why should you choose Apparel Search Logistics as your certification partner? 1. Our vast experience gained from extensive involvement in the development through implementation of the C-TPAT program. 2. Our focus is on the development of efficient and cost effective programs that meet your business requirements as well as meet or exceed C-TPAT standards. 3. We deliver the rapid and measurable results that your business requires. 4. We are used to rolling up our sleeves and getting our hands dirty. You can depend on us to be at your side and to go the distance.